Jeffrey Braden Francoeur (/fræŋˈkʊər/; born January 8, 1984), nicknamed "Frenchy", is an American professional baseball right fielder who is a free agent. He has played in Major League Baseball (MLB) for the New York Mets, Texas Rangers, Kansas City Royals, San Francisco Giants, San Diego Padres, Philadelphia Phillies, Atlanta Braves and Miami Marlins. Francoeur is noted for his strong throwing arm in the outfield and his free-swinging tendencies in the batter's box. He won a Rawlings Gold Glove Award in 2007. Francoeur was selected by the Braves in the first round of the June 2002 amateur draft. A 4-star Defensive Back committed to Clemson, he chose to forego college to play baseball. After the draft, Francoeur was assigned to the team's advanced Rookie League club in Danville, Virginia, where he played 38 games and hit .327 with 8 home runs and 31 RBIs. Francoeur advanced steadily through the Braves minor league system, playing for Rome (Low A) in 2003, Myrtle Beach (High A) and Greenville (former AA) in 2004, and Mississippi (AA) in 2005. Francoeur was a member of the Rome Braves inaugural season team which went on to win the 2003 South Atlantic League Championship. He led that team in home runs with 14. In 2004, Francoeur was named the top prospect in the Braves organization by Baseball America. He was a member of the Carolina League regular season and postseason All-Star team. In 2005, he was selected to play in the All-Star Futures Game before getting called up by Atlanta. In March 2014, after he was released by the Cleveland Indians, Francoeur signed with the San Diego Padres and was sent to the El Paso Chihuahuas in Triple A. Francoeur's new teammates played an elaborate month-long prank on him by convincing him that pitcher Jorge Reyes was deaf. Reyes cooperated with the prank, maintaining the appearance of being deaf by not speaking or listening to music. Chihuahuas first baseman/outfielder Cody Decker made a short film about the prank. Sportswriter Peter Gammons called Decker "My new favorite person." Francoeur was promoted by Atlanta on July 6, 2005. He was part of a group of rookie players, nicknamed the "Baby Braves", that Atlanta called up from its minor league system during the 2005 season. Francoeur made his Major League debut the following day when he started in right field against the Chicago Cubs in the second game of a double header. In the bottom of the 8th inning he hit a 3-run homer to center field, his first Major League hit. Francoeur is famous for his promise at the very beginning of his career: he made the cover of the edition of August 26, 2005 of Sports Illustrated, who dubbed him "The Natural" after he hit .360 with a 1.067 OPS in his first 37 games. Francoeur finished the season batting .300/.336/.549 in 67 games, with 14 home runs and 44 RBIs. During his rookie season he garnered a reputation as a free swinging fastball hitter, with his first walk not coming until his 128th plate appearance. On defense, Francoeur became known for having a strong and accurate arm, finishing the season with 13 outfield assists (third overall in MLB) despite playing less than half the season. He finished third in the National League Rookie of the Year voting while garnering the most second place votes. Francoeur hit .260 with 29 homers and 103 RBIs in his first full season in the majors. He also became just the fourth Brave to play in all 162 games of a season, joining Félix Millán, Dale Murphy and Andruw Jones. Francoeur was ejected for the first time in his career on July 16, 2006. On May 13, 2006, Francoeur hit a walk-off grand slam against the Washington Nationals, the first walk-off home run and grand slam of his career. In his second full season in 2007, Francoeur batted .293 with 19 homers and 105 RBIs. Francoeur also displayed talent on the defensive side of the field, leading the league in outfield assists with 19 while earning his first career Gold Glove. Francoeur played in all 162 games for the second consecutive season. He was ejected for the second time in his career on July 16, 2007, exactly one year to the day of his first ejection. On April 12, 2008 Francoeur went 3 for 5 against the Washington Nationals including two home runs and a career high seven RBIs. He compiled a streak of 370 consecutive games played before sitting out the second game of a doubleheader on May 20, 2008. On May 22, 2008 Francoeur went 3 for 4 against the New York Mets with an RBI triple, an RBI single, and a two-run home run, finishing a double short of a cycle. After weeks of being mired in the worst slump of his career, Braves management optioned Francoeur to Double-A Mississippi on July 4, 2008 to work with his old hitting coach Phillip Wellman and refine his swing away from the pressurized major league setting. Francoeur had posted a line of .234/.287/.374 to that point of the season. Francoeur was recalled on July 7, 2008, after only three days in the minors because of the rash of injuries suffered by the Braves over the holiday weekend. His slump continued after his return to the majors; he posted a .234/.300/.324 line through September 10. On July 10, 2009, Francoeur was traded to the New York Mets for outfielder Ryan Church. He made his Mets debut on July 11, 2009 and notched two RBIs in his first at bat. He finished the day going 2–4 with two RBIs, a strikeout, and was caught stealing once. On July 20, Francoeur hit his first home run as a Met off Washington Nationals pitcher Logan Kensing during the ninth inning of that game. On August 23, 2009, Francoeur became the second player in major league history (after Homer Summa in 1927) to hit into a game-ending unassisted triple play. 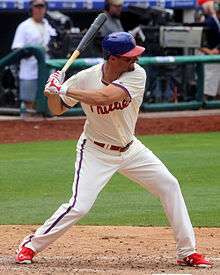 He hit a line drive directly to Eric Bruntlett, second baseman for the Philadelphia Phillies. Francoeur re-signed with the Mets for 2010. After being the Mets' starting right fielder for the first half of the 2010 season, Francoeur was replaced by Ángel Pagán to make room for the return of Carlos Beltrán in the second half. On August 31, 2010 Francoeur was traded from the Mets to the Texas Rangers for infielder Joaquín Árias. He was utilized primarily for defensive purposes on the 2010 AL Champions. On December 8, 2010, Francoeur signed a one-year deal with the Kansas City Royals worth $2.5 million which included a mutual option for the 2012 season. On August 18, 2011, Francoeur agreed to a two-year extension with the Royals worth $13.5 million. He was designated for assignment on June 30, 2013 after hitting .208/.249/.322 in 59 games with the Royals. Francoeur was signed by the Giants on July 9, 2013. On July 13, his contract was purchased. He was designated for assignment on August 20, and released on August 22. In 22 games for the Giants, Francoeur recorded 12 hits, 4 RBI and a batting average of .194. Francoeur signed a minor league deal with the Cleveland Indians on January 6, 2014. The organization released Francoeur on March 22, 2014. Francoeur signed a minor league deal with the San Diego Padres on March 26, 2014. He was assigned to the Triple-A El Paso Chihuahuas and hit the first home run in team history on April 3, 2014. They considered converting him into a pitcher, and he spent part of his time in the minors pitching. However, they decided to keep him as an outfielder in the end. He was called up and was in the starting lineup on July 23. On August 11, Francoeur was designated for assignment. He cleared waivers and was outrighted back to the Chihuahuas. Francoeur elected free agency in October 2014. On November 13, 2014, Francoeur signed a minor league contract with the Philadelphia Phillies. On June 16, 2015, Francoeur was used as a relief pitcher in a 19–3 loss to the Baltimore Orioles, throwing the only scoreless inning of the game. However, he surrendered two runs in the next inning. In July, he began to have success both off the bench and in the starting lineup, including a stretch during which he hit three home runs in eight games. Although he expressed a desire to remain with the Phillies through the 2015 season and perhaps even beyond, his play indicated he might be moved near the trading deadline to bolster a contending team's outfield. However, he was not moved at the trade deadline. Ultimately, he finished the season with a .258 batting average, 13 home runs, and 45 RBIs. On February 22, 2016, Francoeur agreed to a minor-league deal with the Braves, with an invitation to spring training. On March 29, the Braves purchased Francoeur's contract. He was traded to the Miami Marlins on August 24. Along with former Braves teammate Chipper Jones, Francoeur played on the USA team in the first ever World Baseball Classic in March 2006. In six at bats, he hit a double and scored a run. Francoeur comes from a family of teachers. His parents, David and Karen, are both retired teachers. Francoeur's father, who is of French-Canadian heritage, is from Springfield, Massachusetts; his mother is from Green Bay, Wisconsin. His sister Heather (Francoeur) Karvis used to teach English and co-coached the girls' basketball team at St. Pius X Catholic High School in Atlanta with Josh Geffner. She now teaches and coaches the varsity girls basketball team at The Westminster Schools in Atlanta. His brother David Francoeur, Jr. teaches special education at Parkview High School in Lilburn, Georgia. In 2007, on SportSouth the "Big Braves Summer" promos, Francoeur revealed that his profession of choice (were he not a baseball player) would be coaching high school football. He graduated from Parkview High School in Lilburn, Georgia in 2002. He lettered in both baseball and football. He led Parkview to the Georgia AAAAA high school football championships in 2000 and 2001 as a wide receiver and defensive back. Francoeur was offered a scholarship to play wide receiver at Clemson University, before turning that down and getting drafted in the first round. He also led Parkview to two state titles in baseball, in 2001 and 2002. While in third grade, he met his future wife, Catie McCoy Francoeur. They started dating as seniors in high school, and married on November 3, 2007. Francoeur lived with teammate Brian McCann in Lawrenceville, Georgia for their first two years in the majors, and he had his own fan club at Turner Field called "Francoeur's Franks." In 2007, Francoeur participated in a fundraiser for the Atlanta-based charity Dream House for Medically Fragile Children in which Delta Air Lines donated the value of 25,000 SkyMiles (frequent flyer miles) for each home run hit by Francoeur during the season. Francoeur is a vocal and outspoken born-again Christian. On the strap of his left batting glove, Francoeur has the phrase "Joshua 1:9" written, referencing the Bible verse. ↑ "2003 Rome Braves". The Baseball Cube. Retrieved October 18, 2010. 1 2 3 4 "Jeff Francoeur's minor league teammates tricked him into thinking a pitcher was deaf". USA Today. Retrieved April 15, 2014. 1 2 Townsend, Mark. "Jeff Francoeur's new Triple-A teammates welcome him with month-long prank". Yahoo! Sports. Retrieved April 15, 2014. ↑ King, James. "Baseball Team Convinces teammate Jeff Francoeur That Another Teammate Is Deaf For A Whole Month | Mail Online". Dailymail.co.uk. Retrieved April 15, 2014. ↑ "Peter Gammons: My new favorite person, Cody Decker". GammonsDaily.com. Retrieved April 15, 2014. ↑ "Francoeur, who has played in MLB-best 370 straight games, sits vs. Mets, May 21, 2008". Sports.espn.go.com. May 21, 2008. Retrieved October 24, 2010. ↑ Braves option Francoeur, MLB.com, Mark Bowman, July 4, 2008. Retrieved on 2008-07-04. ↑ Francoeur rejoining Braves in L.A., Atlanta Journal-Constitution, Carroll Rodgers, July 7, 2008. Retrieved on July 7, 2008. ↑ Gurian-Peck, David (August 23, 2009). "Phils back Pedro in NY, win on rare feat". MLB.com. Retrieved August 24, 2009. ↑ "Francoeur excited to join Royals: After agreeing to one-year deal, will patrol right field next year". Kansascity.royals.mlb.com. March 27, 2014. Retrieved April 15, 2014. ↑ "Jeff Francoeur". Baseball Reference. Retrieved March 5, 2014. ↑ "Indians release OF Jeff Francoeur". ESPN.com. Associated Press. March 22, 2014. Retrieved March 22, 2014. ↑ Curtright, Guy (March 26, 2014). "Parkview grad Francoeur, cut by Indians, quickly signed by Padres". Gwinnett Daily Post. Retrieved July 22, 2014. ↑ Jones, Michael C. (May 18, 2014). "Jeff Francoeur comeback: Ex-outfielder begins return as pitcher with Padres". Sports Out West. Retrieved July 22, 2014. ↑ "Francoeur brought up by Padres". ESPN.com. Associated Press. July 23, 2014. Retrieved July 24, 2014. ↑ Adams, Steve (August 11, 2014). "Padres Designate Jeff Francoeur For Assignment". mlbtraderumors.com. Retrieved August 11, 2014. ↑ Polishuk, Mark (October 6, 2014). "Players Who Have Elected Minor League Free Agency". mlbtraderumors.com. Retrieved October 6, 2014. ↑ Calcaterra, Craig (November 13, 2014). "The Phillies sign Jeff Francoeur, seven others to minor league deals". hardballtalk.nbcsports.com. Retrieved November 13, 2014. ↑ Perry, Dayn (June 16, 2015). "WATCH: Jeff Francoeur (!) breaking ball freezes Nolan Reimold". CBS Sports. Retrieved June 17, 2015. ↑ "Orioles 19, Phillies 3". MLB.com. MLB Advanced Media. June 16, 2015. Retrieved June 18, 2015. ↑ Zolecki, Todd (July 24, 2015). "Jeff Francoeur stays hot with another home run". MLB.com. MLB Advanced Media. Retrieved July 25, 2015. ↑ Bowman, Mark (February 22, 2016). "Francoeur 'back home' with Braves on Minors deal". MLB.com. Retrieved February 23, 2016. ↑ Bowman, Mark (March 29, 2016). "Braves keeping Francoeur, will add him to roster". MLB.com. Retrieved March 31, 2016. ↑ Bowman, Mark (August 24, 2016). "Francoeur headed to Marlins in 3-team deal". MLB.com. Retrieved August 24, 2016. ↑ Listing of girls' basketball coaches for St. Pius X Catholic High School. Retrieved on 2008-08-31. ↑ Listing of English teachers at St. Pius X Catholic High School but has since taken the head coaching position at the Westminster School. Retrieved on 2008-08-31. ↑ Parkview High School Staff. Retrieved on 2008-08-31. ↑ Costa, Brian (July 17, 2009). "Jeff Francoeur returns to Atlanta with NY Mets, grateful to be out of Braves spotlight". The Star-Ledger. Retrieved July 22, 2014. ↑ "He may be a dork, but he shuns cork". U-T San Diego. August 22, 2005. Retrieved July 22, 2014. ↑ "Francoeur marries high school sweetheart". MLB.com. November 5, 2007. Retrieved July 22, 2014. ↑ "Francoeur, McCann enjoy relaxing in Lawrenceville". Gwinnett Daily Post. February 21, 2006. Retrieved July 22, 2014. ↑ Haney, Travis (September 4, 2005). "Francoeur hits, gets hit in Braves' rout of Cincinnati". Online Athens. Retrieved July 22, 2014. ↑ "Francoeur home runs to help Dream House for Medically Fragile Children". Atlanta Business Chronicle. July 13, 2007. ↑ J. Gerald Harris, Editor (March 15, 2007). "Soaked and surrendered in San Francisco". Christianindex.org. Retrieved October 18, 2010. ↑ Krattenmaker, Tom (2010). Onward Christian Athletes. Rowman & Littlefield. pp. 116–117. ISBN 9780742562479. Wikimedia Commons has media related to Jeff Francoeur.